Many, many months ago, my dear husband was tasked with organizing the home of a relative, and in the process he has found some true treasures. I've blogged some of the photos before, but I can't help but post them again because I, myself, am shocked that we have this. 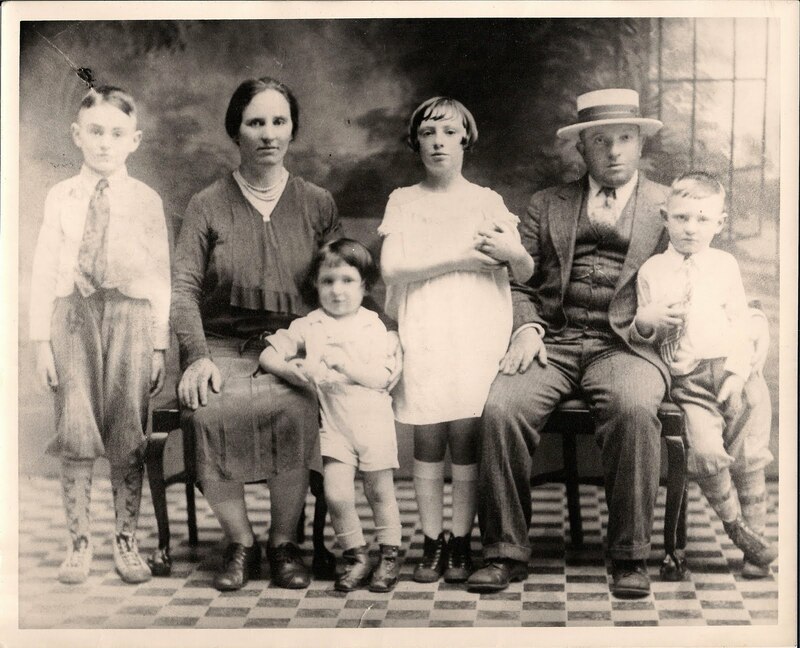 The only surviving family photo of the Berkowitz family. The three oldest (on the far left, middle, and far right) were the only to survive. 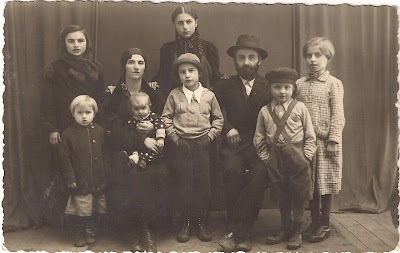 Two of the sisters married two of the Katz brothers, pictured below. That being said, we were told by this relative whose house Tuvia is organizing that there was a Sefer Torah somewhere in the house. Now, Tuvia had no prior knowledge of such an item in the family and neither did anyone else. Tuvia made sure to look for the Sefer Torah, and even checked with the local synagogues to see if it had been donated back in the 1960s as we'd been told it might have been. Eventually, Tuvia gave up and assumed the Sefer was gone, never to be seen again -- after all, it hadn't been seen in probably 30 or 40 years. And then? He found it! Out of the blue, there it was, rolled up safely in a carpet. Okay, hold on, you're probably asking yourself: Why on earth does Tuvia's family have a Sefer Torah hanging out somewhere in their house? Well, legend has it (seriously) that when the Wilkes-Barre, Pennsylvania, community's four synagogues combined forces as the community shrank, the Sifrei Torah were dished out to members of the community who had donated money toward the original writing/purchase of the scrolls. 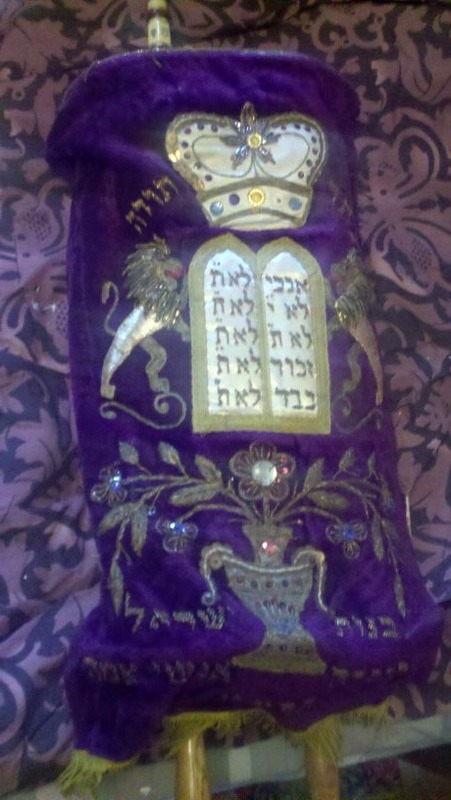 The person in charge of the disbursement was my husband's grandfather's step-father, so -- knowing that the family had given toward the scroll -- handed the Sefer Torah over to the family. Thus, there's a family Sefer Torah, and this is where you come in. We took the sefer to a sofer (scribe) to give it a once over and let us know what kind of shape it was in and what it would take to fix it. Yes, we noticed right away that one of the etz chayims was missing (that's the wooden thing that the parchment is rolled on), but the parchment looked like it was in pretty good condition. But these things aren't cheap, folks. The sofer aged the Sefer Torah to at least 70-80 years, and he said that it's in pretty good condition for being so old. (Of course, my first thought was: I wonder if this came from Europe pre-Shoah?) The klaf (parchment) has some fraying and small tears, but nothing too severe. It is written in Ksav Bait Yosef, which is the Ashkenazi form of lettering. Oddly enough, one section of the sefer -- from Parshat Ekev through Ki Setzei -- was written by a different sofer, meaning that perhaps the section was damaged and needed to be written. 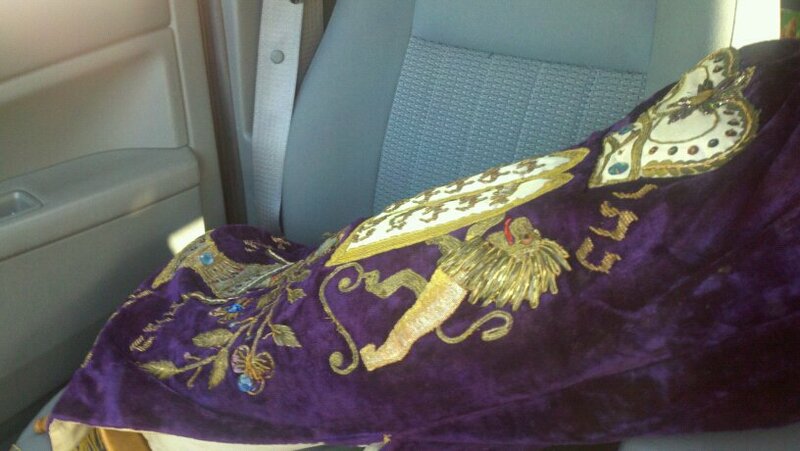 The Sefer Torah goes for a ride ... to the sofer! Despite it being in good shape, there's been a lot of fading in Sefer Bamidbar and Devarim, and that with a complete refurbishing, we'll be good to go with a beautiful Sefer Torah! There also is a lot of wonky things going on with many of the letters like the yod (י), hey (ה), chet (ח), and tet (ט), which means that the refurbishing will cost anywhere between $1,500 to $3,400 (depending on if we go machmir and get the letters fixed). Yikes. we believe, is who gave money toward the purchase or writing of the scroll. As the sofer said, "The mitzvah of actually writing a Sefer Torah is one that does not come around very often. Consider this a great zechus and a perfect opportunity to fulfill it in a most Mehudar way." Translated: To take part in fixing up a Sefer Torah is a great virtue and fulfills a mitzvah in a most enhanced way! And this is where you guys come in. The sefer recommends doing the minimum fixing of $1,500 plus fixing the yod ("The letter י is missing the 'kotz' in the majority of instances. 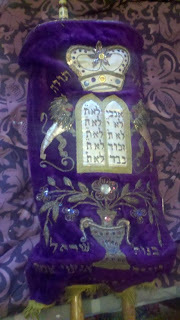 According to the vast majority of poskim, this renders the Torah possul, and must be repaired") for $600. Will you help us in this mitzvah? To help us in this mitzvah, click on the DONATE button on the top right of my homepage. We are trying to raise at least $2,100 by the High Holidays! I will be compiling a list of those who donate, and we hope to somehow acknowledge the donors upon the completion of the Sefer Torah's renovations by Rosh HaShanah!